When used as money, gold extended the market across borders. People on both sides of a border desired gold, irrespective of the image on the bar or coin (after 700 B.C.). It could be melted down and re-cast. Someone else’s image could be stamped on it. Additional voluntary exchanges became possible because there was a ready market for gold. Thus, because gold was not just another commodity, it facilitated the extension of the division of labor. Men’s productivity rose because they could specialize in their work. They got better at whatever it was that they did for a living. Investors will be surprised to know the main factor that drives the gold price. And no, it isn’t the oil price or market. While the oil price has been a good indicator for the gold price over the past 50+ years, it hasn’t done much over the shorter term. However, there is a gold market demand factor that seems to move the gold price more than any other indicator. In my newest video update, GOLD INVESTING: What Really Drives The Market Price, I discuss how different aspects of the gold and broader markets impact the gold price. When I did the research and put together the charts, I was a bit surprised by the results of the data. For example, precious metals investors might believe that physical gold investment demand is one of the leading drivers of the gold price. While that may have been true in the past, or after an economic and financial meltdown like we had in 2007-2008, physical gold bar can coin demand does the exact opposite of the gold price. As we can see in the chart above, the GREEN BARS show that when the gold price (White line) decreases, the demand for gold coin and bar increases. 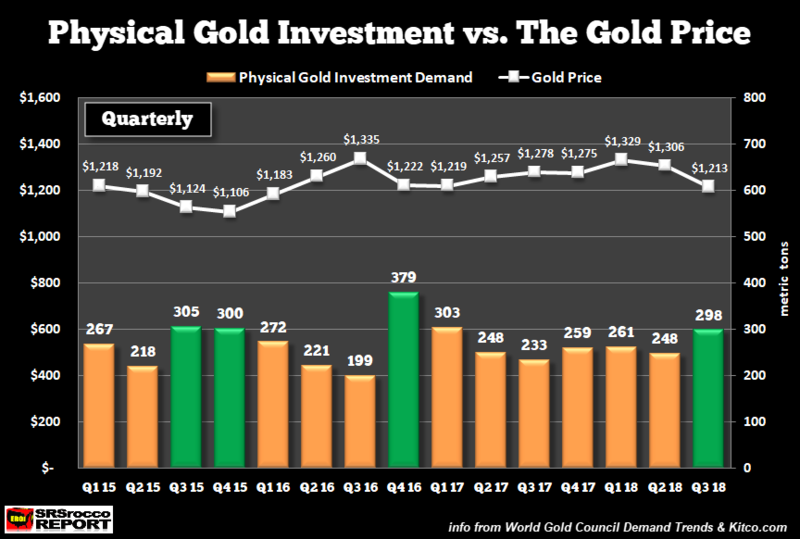 In Q3-Q4 2015 when the gold price fell to new lows, physical gold investment demand increased to 305 metric tons in Q3 2015 and 300 metric tons in the next quarter. Also, when the gold price fell from a peak of $1,335 in Q3 2016 to $1,222 in the last quarter of 2016, gold coin and bar demand surged to 379 metric tons. We can also see the same trend in Q3 2018 when the gold price declined. To understand what has been the leading driver of the gold price, I suggest you watch the video, and the result is quite surprising.